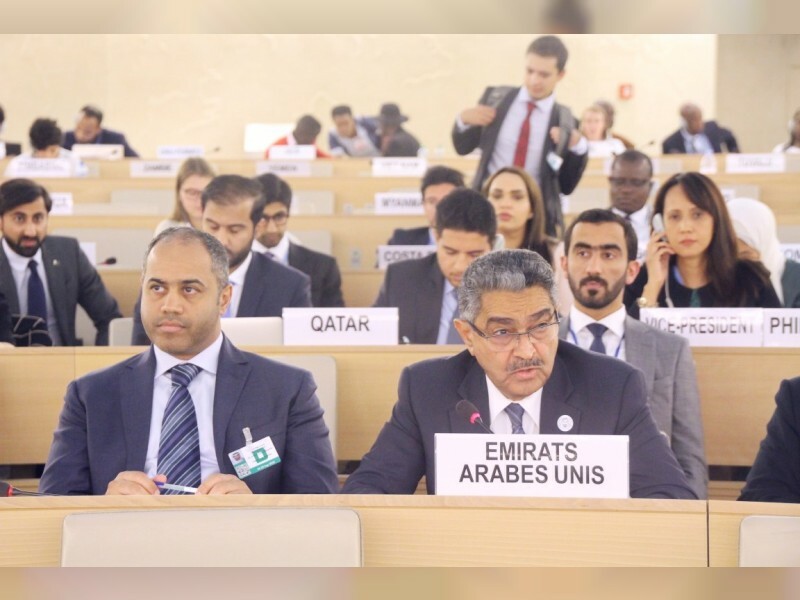 GENEVA, 11th September, 2018 (WAM) -- Obaid Salem Al Zaabi, Permanent Representative of the UAE at the United Nations, UN, in Geneva, delivered on Tuesday a statement on behalf of the the United Arab Emirates, Kingdom of Saudi Arabia, Kingdom of Bahrain and the Arab Republic of Egypt, before the UN Human Rights Council, as part of the right of reply to the allegations stated in the Qatari statement during the 39th regular session of the council in regards to the debate of the oral briefing of the United Nations High Commissioner for Human Rights. The statement reads: Mr. President, The Qatari statement, as usual - tried today to drag the UN mechanisms into a political crisis whose main trigger is the Qatari practices and policies against our states. We reaffirm that the boycotting measures taken by the quartet against the Qatari regime fall within the context of exercising their sovereign rights to protect their national security from Qatari irresponsible policies which aimed to destabilise security and stability in our states. These measure are not a blockade in any way as Doha claimed. The quartet has repeatedly affirmed these measures, which aim to protect our security and peoples, will be lifted once the Qatari government stops supporting and funding terrorism and responds to our concerns that were repeatedly announced by our leaders for the sake of protecting stability in the region. The Qatari side must show a sign of good faith to open a responsible dialogue with our states under the Kuwaiti mediation. We reiterate our states' commitment and readiness to show positive cooperation with the Kuwaiti mediation to end this political crisis away from Doha's tireless attempts to take it from the regional to the international context. We believe that these attempts will lead to nothing, but to protract the political crisis without reaching true understandings that guarantee security and stability to our states and peoples. Mr. President, Our states express their conviction that members of the Human Rights Council must engage in a collective, collaborative effort to protect the principles of the fundamental human rights and common objectives by not plunging into futile disputes. We call all members to work together to prevent any abuse of this council by raising issues out of its mandate and to take necessary measures to maintain credibility of the council and its work ethics by keeping debates at an excellent and honest level as much as possible.